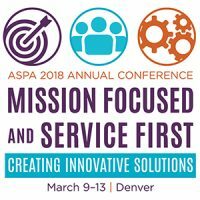 ASPA’s 2018 Annual Conference convened in Denver, March 9-13, around its theme: Mission Focused and Service First: Creating Innovative Solutions. Within this framework, plenary lecturers and other featured speakers were drawn to a similar topic of discussion: constituents at all levels of civic participation are searching for ways to engage with their leaders and it is public administration’s role to help them learn how. Four plenary lecturers and keynotes captured attendees’ attention during the conference, looking at civic engagement and participation, technology, ethics and more. One of the more notable speakers, Walter Shaub, Jr. (formerly director of the U.S. Office of Government Ethics) addressed conference attendees on Monday morning as the 2018 Nesta M. Gallas Lecturer and provided a look at the current presidential administration and its ethical missteps. Outlining an array of decisions that have left many members of the Trump administration in a quagmire, Shaub’s point was larger than politics: the ongoing trend of failing to appreciate public service is damaging to its future. In fact, “the people” is where the conference started. The opening keynote lecture, given by Valerie Lemmie of the Kettering Foundation, reflected on how we can help democracy work as it should. “Citizens do not get involved in what they do not care about, or if they do not feel they have been heard. How do we create these spaces?” Lemmie asked. “Fixing their issues” is where Stone Lecturer Tina Nabatchi of Syracuse picked up the dialogue on Monday afternoon. Her presentation focused on public participation and creating civic infrastructure for it. “Lots of processes are meant to push citizens to a pre-determined outcome. The answer to that is to engage people earlier in the process,” Nabatchi observed. This discussion of systems and processes, including using technology as an aid, intersected with this year’s Elliot Richardson Lecturer, P.K. Agarwal, as he discussed innovation and technology in government. Looking at disruption, wealth creation, transformation and the challenges all of these elements bring to the public sector, Agarwal led his audience through a brief history of everything the industrial and technology revolutions have meant for society. From horse-drawn carriages to the Model T, from Uber to drones to driverless cars, Agarwal outlined the ways technology has pushed us forward—and the challenges public administrators must address in order to maintain an orderly society. If creating space for engagement was a common theme on the main stage, “Which space?” and “Created for whom?” became a drumbeat within that dialogue. The Gloria Hobson Nordin Social Equity Luncheon, Section for Women in Public Administration Breakfast and presidential panels all looked at answering these questions. Gloria Hobson Nordin Award winner L. Douglas Wilder, former governor of Virginia, reflected on “for whom” during his remarks at Sunday’s luncheon. “For whom,” also was examined during a presidential panel looking at inclusion in public spaces, as panelists discussed which people are publicly recognized for their contributions through public monuments. Panelists looked at the broader issue of how public administrators should go about choosing who and what to commemorate, as well as the underlying issues of history, heritage, power, revisionism and dialogue. Equality was also examined during the Section for Women in Public Administration breakfast, when keynote speaker Brenda Allen, University of Colorado Boulder’s vice chancellor of diversity and inclusion, looked at divisions within divisions. Including Section-led symposia, hands-on workshops, Founders’ Fellows panels and more, the five days of sessions enabled almost 1,300 attendees to bridge the scholar-practitioner divide and engage with each other around how each of them can better enable society to solve our challenges in new and different ways. While buzz is already building around ASPA’s 2019 conference, taking place March 8-12 in Washington, DC, those who were in Denver are just beginning to put some new data, skills and knowledge to use to create new spaces—for new ideas, better research, redirected missions and better engagement that reflects the public we all serve.